This is the last year physicians and other eligible professionals can earn a Physician Quality Reporting System incentive payment. The incentive payment will be 0.5 percent in 2016. If practitioners do not satisfactorily complete the Physician Quality Reporting System (PQRS) requirements in 2014, payments will be lowered by 2 percent in 2016 for services provided under the Medicare physician fee schedule. Individual eligible professionals and group practices have new options for reporting this year. The options are two of the many changes the Centers for Medicare & Medicaid Services (CMS) has made to the reporting system for 2014. Quality measures have been aligned across quality reporting programs so that physicians may report a measure once to receive credit in all quality reporting programs in which that measure is used. CMS also has more closely aligned PQRS measures with the National Quality Strategy and meaningful-use requirements. The agency is transitioning away from process measures in favor of performance and outcome measures. Physician Quality Reporting System now includes 287 measures and 25 measures groups. Of these, 57 individual measures and two measures groups are new. In some cases, the same criteria for satisfactory reporting for both individual eligible professionals and group practices apply for purposes of the 2014 PQRS incentive and the 2016 PQRS "payment adjustment," or penalty. By meeting the required criteria to earn the incentive, they also avoid the downward payment adjustment that applies in 2016. A somewhat controversial reporting change for individual eligible professionals is the increase in the number of measures from three to nine covering at least three National Quality Strategy (NQS) domains for the 12-month period. This applies when practitioners report data via the claims, registry and electronic health records-based reporting mechanisms. Centers for Medicare & Medicaid Services finalized the increase despite a majority of negative comments received during the comment period. Most viewed the new requirement as "too onerous." In response to the opposition expressed, CMS said in its final ruling, "We believe six years is enough time for eligible professionals to familiarize themselves with the reporting options for satisfactory reporting under the PQRS." The good news is that, for certain satisfactory reporting criteria, Centers for Medicare & Medicaid Services has lowered the threshold for reporting individual measures via registry from 80 percent to 50 percent of applicable patients. Additionally, CMS has eliminated the option for individual eligible professionals to report claims-based measures groups. Eligible professionals can report PQRS measures groups only via registry. The new reporting option enables individual practitioners to meet PQRS requirements beginning in 2014 through satisfactory participation in a qualified clinical data registry. Under this option, eligible professionals report the data on quality measures used by the qualified clinical data registry, including non-PQRS measures. They may report measures on all patients, regardless of whether they are Medicare Part B fee-for-service patients. Each measure for at least 50 percent of applicable patients. At least one outcome measure of the measures reported. To avoid the 2016 PQRS payment penalty, eligible professionals participating in qualified clinical data registries need only report three measures covering one NQS domain for at least 50 percent of applicable patients. CMS has adopted a new reporting mechanism for group practices as well – the certified survey vendor reporting mechanism. Under this option, a group comprised of 25 or more eligible professionals can report Clinician and Group Consumer Assessment of Healthcare Providers and Systems (CG-CAHPS) survey measures in conjunction with other PQRS reporting mechanisms. 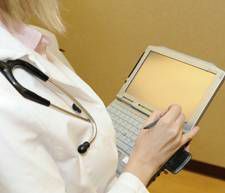 Specifically, the group must report all CG-CAHPS survey measures via a CMS-certified survey vendor and at least six measures covering at least two of the NQS domains using a qualified registry, direct electronic health record (EHR) product, EHR data submission vendor, or group practice reporting option Web interface. To participate in the group practice reporting option, groups must register by Sept. 30, 2014, the 2014 reporting period. Group practices of 25 or more individual eligible professionals who wish to report the CG-CAHPS survey measures must indicate their intent to do so upon registration. There is now a single website where group practices of 25 or more individual eligible professionals may register to participate in the PQRS group practice reporting option and elect to be evaluated for the option by reporting CG-CAHPS measures. For more information on 2014 quality measures and incentive criteria, visit the PQRS webpage at cms.gov.